First of all… some great news. Emily’s white blood cell counts are high enough that she is allowed to travel! So tomorrow morning (12/31) she and her sisters are flying to Rochester. They will drive to Washington DC on Monday to attend the Passion Conference. Then they will hang out in Rochester on Thursday (1/4) through Sunday AM (1/7). Then Ali will stay in Rochester to continue working at Northridge while Morgan and Emily will fly back to Houston Sunday afternoon. Morgan will be in town during Emily’s next week of chemo before heading back to college on January 14. We are so thankful that Emily gets to go on this trip. I’ll never forget Emily pointing to two dates on the calendar before we met with the surgeon. 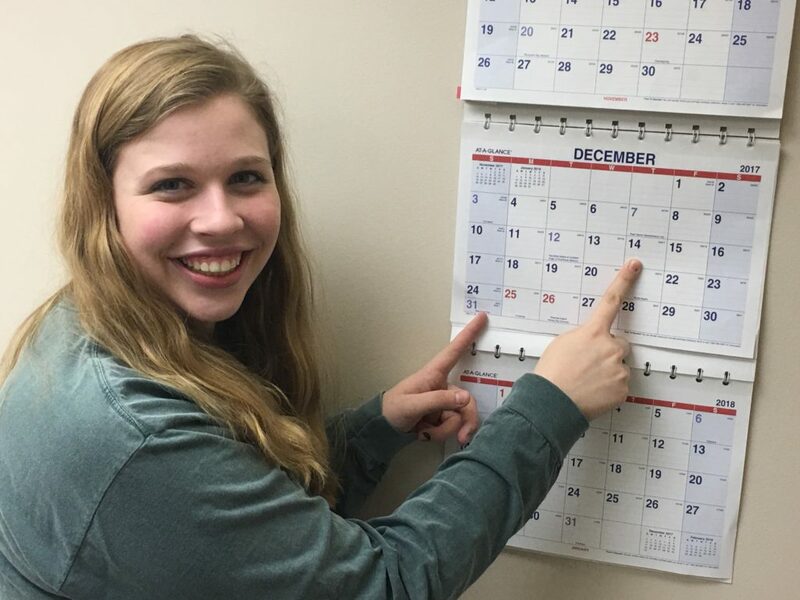 She said, “I don’t know what is coming, but I would love to have nothing on these two days” (and she pointed to December 14th and December 31st). We didn’t even know for sure if she had cancer yet (although we assumed she did at that point). But there were two dates she really wanted to be able to enjoy – 1) Star Wars opening night – she already had her ticket, and 2) Go to Rochester so she could see friends and attend the Passion Conference. I prayed that God might allow that to happen, but I admit my faith was small that both would be accomplished. First of all, we knew a biopsy was coming and if it was cancer (which we assumed it was), chemo would start soon after that. But God answered that prayer in spite of my lack of faith! 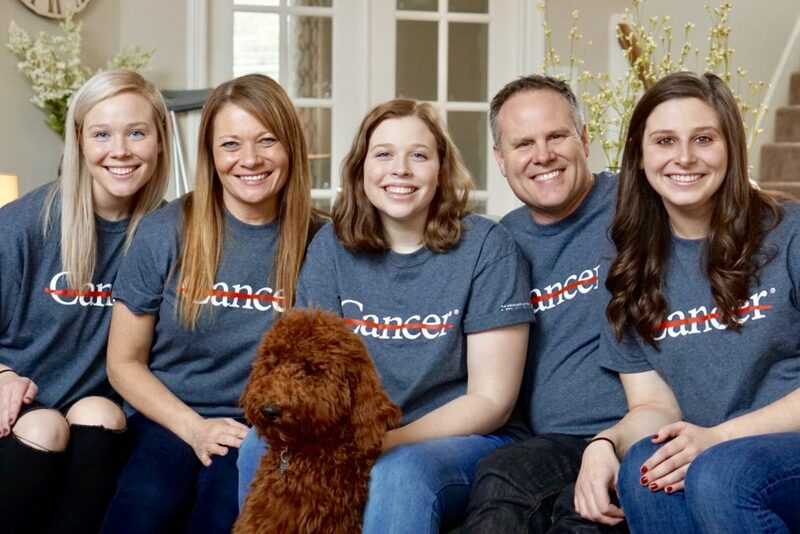 Her going to Rochester postpones her second chemo treatment by only three days. So the oncologist said to “go for it” if it is important to her. We are so thankful. A couple of times in these updates, I’ve mentioned that surgery is coming and the options were all pretty severe. When the surgeon told us it was almost certainly osteosarcoma and surgery would be required, she asked us if we wanted to know the options now or later. I wanted to know right away so we could research the best choice. When she told us the options, it overwhelmed me quite a bit. I was so ignorant about osteosarcoma, that I didn’t realize osteosarcoma is bone cancer. And because it is bone cancer, the cancerous part of the bone and some surrounding healthy tissue must be removed. For some reason, I was thinking about stories of breast cancer or skin cancer. Where you go through difficult chemo and then the tumor is removed, or in some cases, the breast is removed. But when the surgeon went over our options, it took me by surprise. I instantly felt sick to my stomach. In the hours that followed, we all came to accept the reality and began talking about the options. Option 1: Amputation. If cancer has spread to the nearby tendons, nerves, and blood vessels, amputation offers the best option for survival. Emily only wants this option if it is required because cancer has spread to tendons, nerves and beyond. Option 2: Rotationplasty. This one really shocked us. During this complex procedure, the surgeon will remove the cancerous tumor and the knee joint. The surgeon then attaches the remaining portion of the leg and creates a new knee joint using the ankle. During this procedure, the foot will face backward and the ankle will function as a knee joint with a fitted prosthesis attached to the foot. Click here to see images. Basically, the ankle functions as the knee joint and the foot will face backward. That foot is fitted with a leg prosthesis. Emily decided immediately, this was not the option she wanted. Apparently, it is good for athletes as it keeps part of your own body as the knee joint. As far along as technology has progressed, the joints God gave us work better and longer than any artificial joint. But Emily vetoed this option and we understand why. Option 3: Limb-sparing surgery. This is called Distal Femur Resection. This is an attempt to salvage the limb’s function and appearance. It requires the surgeon to perform a removal of the lower part of the femur, followed by the insertion of a metallic implant into the affected area. If you don’t get grossed out, you could see a 3-minute version of the surgery HERE. At this point, Emily is choosing option 3 – as it keeps more of her own leg structure. If the surgeon agrees that is feasible based on her condition, we will likely go with that option. This surgery won’t allow her to be involved in high impact sports or long-distance running, but it will allow her to keep as much of her leg structure as possible. That the cancer has not spread at all. And that the surgery would be successful in removing all the cancer. Emily’s hair is starting to fall out, and that is a hard thing. Pray for God to give her peace. Pray for weather that won’t stop them from getting to Rochester tomorrow. Pray that Emily doesn’t get sick on this trip. If she does, she is to go to the hospital immediately. We know it is risky for her to travel, but the doctors are ok with her travel, and we believe this week is an important week in her life. Pray that she does not get a temperature above 100 degrees (or to the hospital she will go). Pray that our three daughters will have a great week together. Life is going to get harder the next few months, so we just want them to have a great time together, each of them grow spiritually at Passion, and create life-long memories as they travel and hang out together.